Dr. Jesse Brewster, O.D. grew up in Klamath Falls, Oregon where he graduated from the Oregon Institute of Technology with a Bachelor’s degree in Health Science and Biology. Growing up with an Optometrist in his family, being an Optometrist was always his dream. He was able to accomplished that dream in May 2017 where he received his doctorate of Optometry from the University of the Incarnate Word Rosenberg School of Optometry in San Antonio, TX. 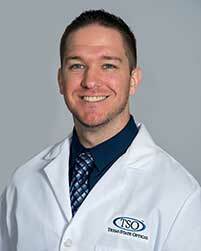 Dr. Brewster is a board certified licensed Therapeutic Optometrist and is also a certified Glaucoma Specialist. Dr. Brewster is trained to diagnose and treat a wide range of eye conditions including Cataracts, Glaucoma, Diabetes, Macular Degeneration, Dry Eye, Corneal Abrasions, and performing Pediatric Eye Exams. His main goal is to perform good quality comprehensive eye exams to patients of all ages. In his free time, he loves to spend time with family and friends and he absolutely loves sports!